I’ll grant this much at least to Gerard Henderson. 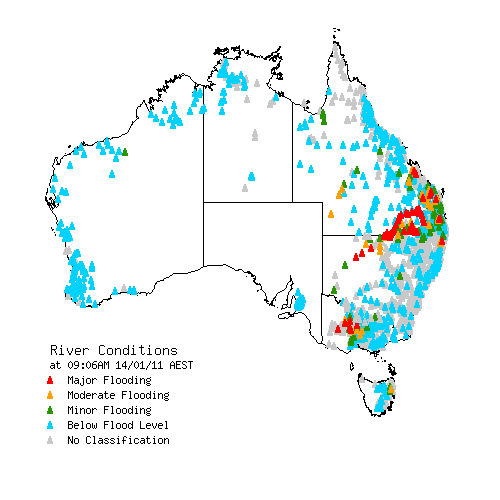 The only way any of can be sure the current Australian floods are related to global warming — or indeed are not — is to take a trip forward on this and come back with the answer. Mind you we do know some things. We know, for example, that the God who threw weather at people because he was mightily peeved at them is dead. This was ever just a very human projection into the cosmos anyway. Nothing like my idea of God which begins at least assuming God is less stupid than we are. We also know this, though some go to extraordinary lengths to pretend otherwise. 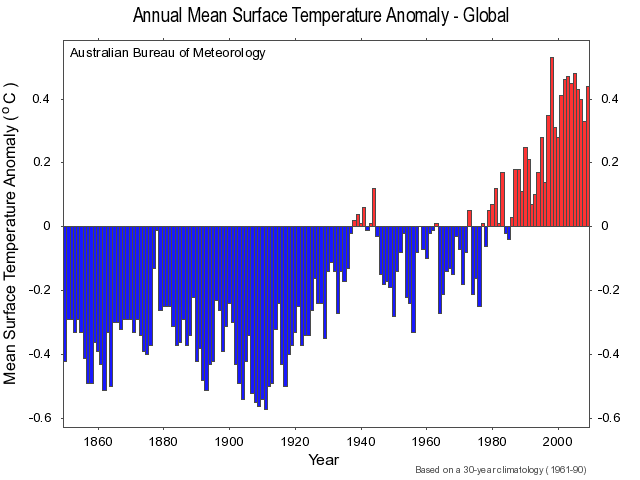 See Climate change is real believe me – News & Media @ University of Wollongong. We also know there has been a procession of rather extraordinary weather events worldwide in the past year. After that we start having problems with the known knowns and the known unknowns and so on. In a sense, then, Henderson is right. 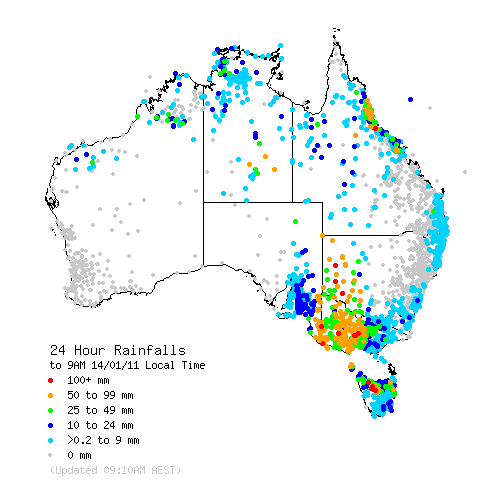 We can’t be sure the Queensland floods are a symptom of anthropogenic climate change, just as we can’t be sure they are not. Being a conservative or a raving greenie won’t settle that matter either, as climate is no respecter of ideology. 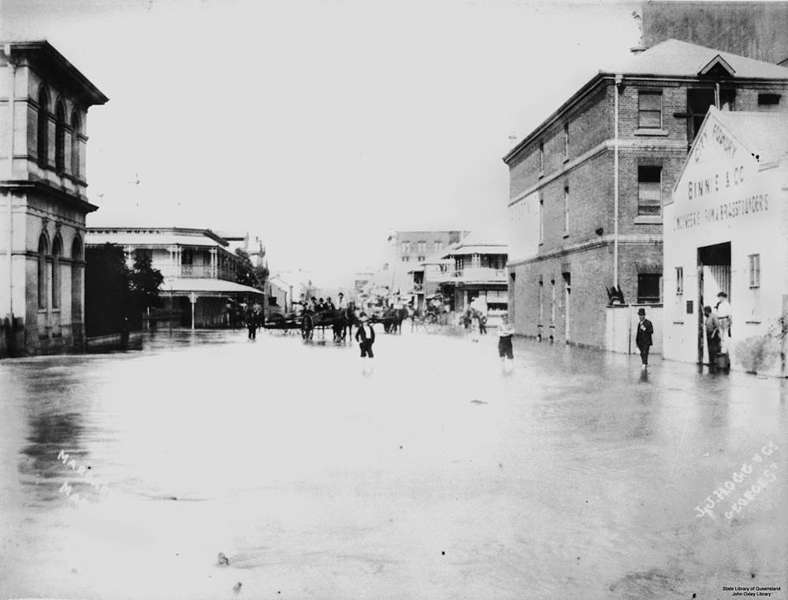 If Brown studied history he would know that there were numerous floods in Brisbane in the 1890s – in 1890, 1893, 1896 and 1898. Eighteen ninety-three was the worst year, with the height of the flood measured at more than nine metres. The history of the time is documented in Ronald Lawson’s book Brisbane in the 1890s, which was published a year before the 1974 flood. I wonder what the 2011 Brisbane flood would have been like without the Wivenhoe Dam, which of course didn’t exist in the 1890s. I am sure someone could model that. There’s clearly a lot to learn too about the effect of global warming (a fact) on the El Nino/La Nina cycle. See this post. 1. Our local news screwed up an interesting story. There has been an international gathering down here of climate scientists discussing possible effects of climate change on the El Nino/La Nina cycle. Our local news confused the issue. It isn’t news that La Nina causes flood conditions — it always has. What is new is wondering about the impact of climate change on this pattern. WIN News didn’t seem to know this. Homework time! 2. Why do the brains of otherwise intelligent conservatives turn to mush when climate change is the question? I refer to Imre Salusinszky. According to the Bureau of Meteorology, 2010 was Australia’s coldest year since 2001. Since logic tells us the planet can’t be getting hotter and colder at the same time, we can confidently pronounce global warming dead, buried and comprehensively beaten. Perhaps the fact that Australia isn’t the whole planet escaped his notice. Because I postponed this series while the flood crisis claimed our attention I was not expecting to post on it tonight, but the SBS News inspired me. This is not the post I planned; that will come later. It is through such coming together, finding common ground while respecting our differences, that we discern the Australian Spirit of 2011 — and by Australian I include ALL actual Australians, all those who live here and are citizens. A group of around 70 asylum seekers at an immigration detention centre in Darwin have cobbled together what little cash they have to support the victims of Queensland’s floods. A Department of Immigration spokesman says the detainees have offered to donate the funds, which they brought with them by boat. 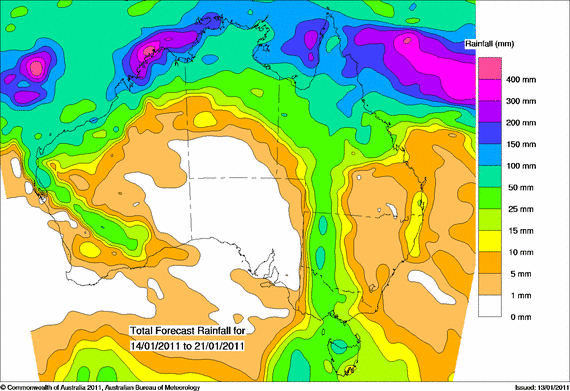 These come from the Bureau of Meteorology here and here.